Just some of the loot up for grabs! As some of you may have read from my last post, I celebrated my 5th blogiversary on October 5th. And it was delectable, thanks in large part to my sister's too-cute cake to celebrate the occasion. 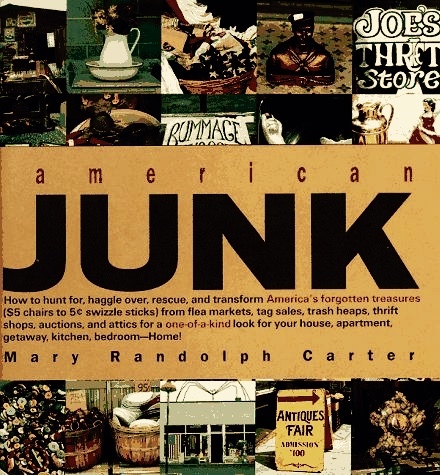 First let me just say that this book is a must-have for any thrifter/flea marketer/antique hunter. The visuals will inspire you to think creatively with your decor and interior design. 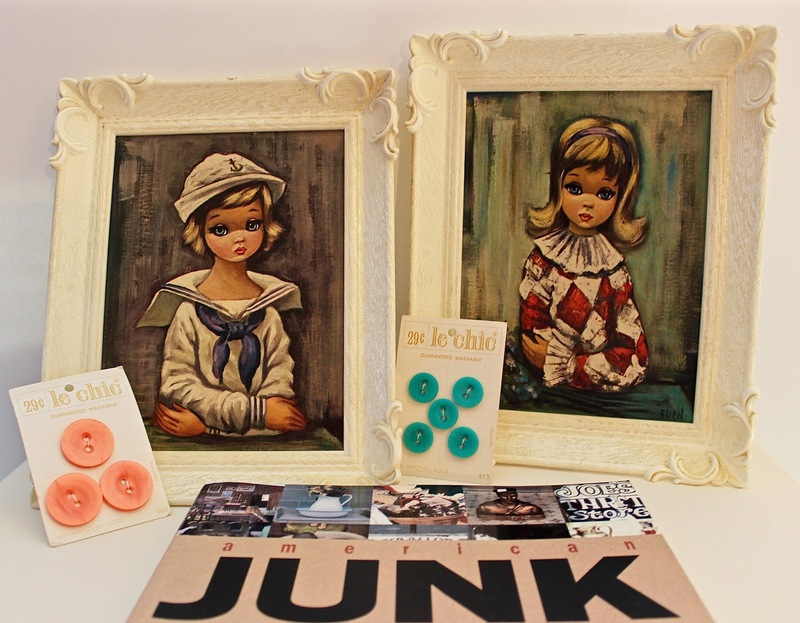 And it's just a fun little collection of enviable junk. I have a hardback copy and flip through it often enough that I came to think---Hey, I should give away a copy to a reader in my next giveaway. Button, button. Who's got the button? 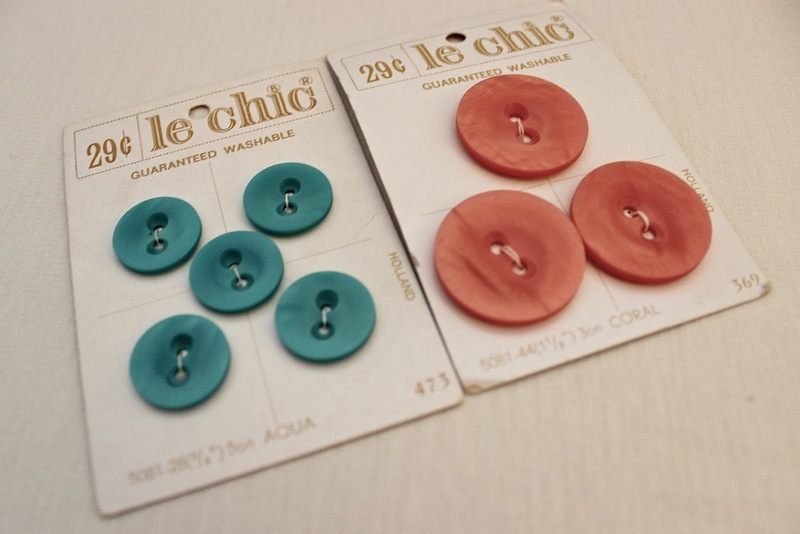 Aren't these vintage Le Chic buttons darling? 5 small aqua buttons, and three larger coral buttons...for your crafting pleasure. 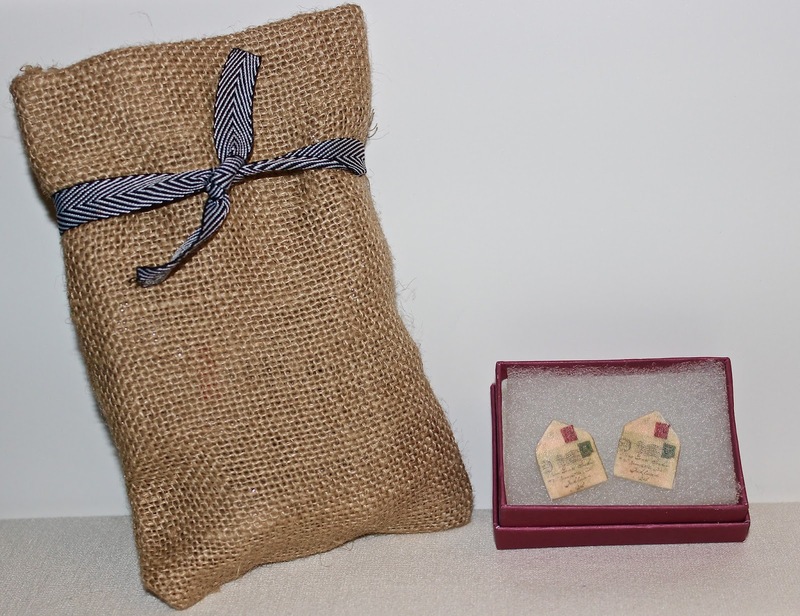 A burlap sack full of fun! 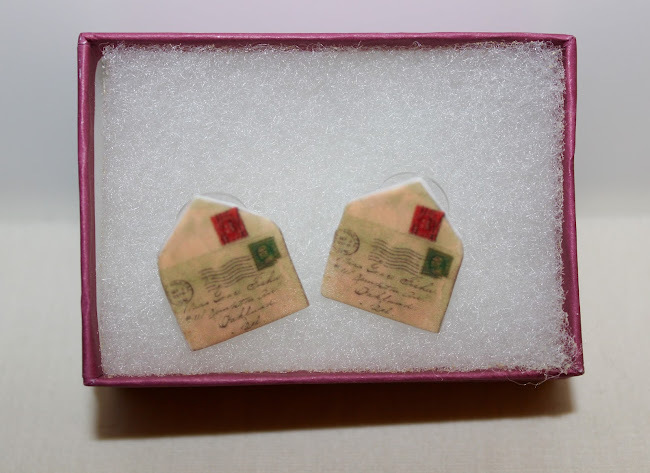 And lastly, a handmade pair of earrings based on a vintage envelope design---just adorable. Annnnddddd a small burlap bag of some of my favorite crafting supplies for you to make something special of your own. Wait. Let's take a closer look at those earrings. I love the faded text and discoloration. It's a tried and true vintage envelope, shrunk way way down using the magic of Grafix Shrink Film. All of these fabulous items can be won with this easy-entry drawing. The contest will close on October 31st, with the lucky winner being announced November 1st. Good luck...and thank you for making these last five year of thrift-blogging a blast. I just found your Facebook page,but loving it already.Thanks so very much for sharing. What a fun, generous giveaway, dear lady. Thank you very much for hosting it! Happiest congrats on half a decade of blogging. What an exciting milestone! Here's the next five and beyond! Thank you, everyone. And good luck! I liked on Facebook Thanks for the chance! What a great giveaway! Congrats on 5 years! Love reading the blog. I had already liked you on Facebook. "Hunting the obscure, the vintage, the kitsch. One thrift store at a time." Visit Let's Go Thrifting 's profile on Pinterest. Jackie Jardine, 2013. Simple theme. Powered by Blogger.